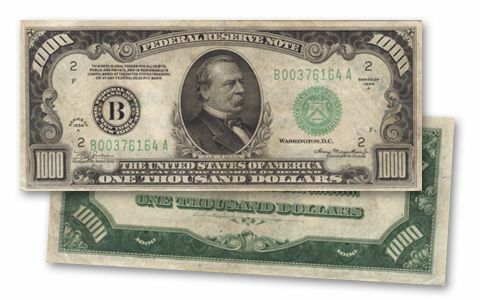 Today it seems that $100 bills disappear from our wallets as fast as $20 bills used to. 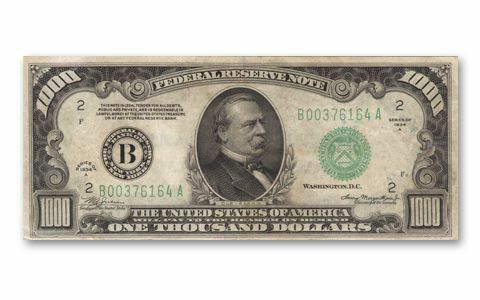 But back in 1934, $500 and $1,000 bills were the largest denomination Federal Reserve Notes in circulation. They were used primarily for bank-to-bank transactions, so ordinary folks never saw them, and, even if they had, they couldn't save them. So, when they were withdrawn from circulation years ago, most were destroyed, making them very hard to find today. We've managed to locate a small group of each at such a good price you can save a substantial amount, while they last. In 1934, you could take a two-month European cruise for a $500 bill and get $5 back in change-but it cost $720 to fly round trip across the Atlantic on the Zeppelin Hindenburg! 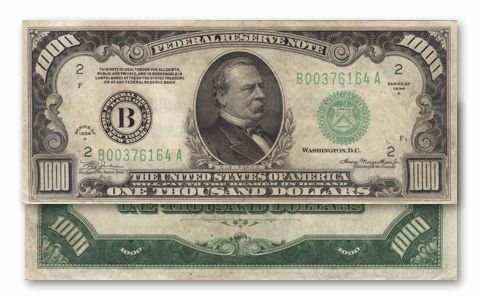 The $500 Note features William McKinley, and the $1,000 Note shows Grover Cleveland. 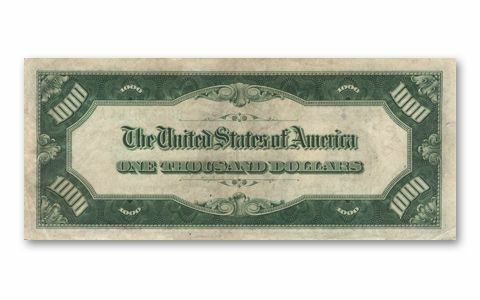 Series 1934 legal-tender Federal Reserve Notes in Very Fine condition.